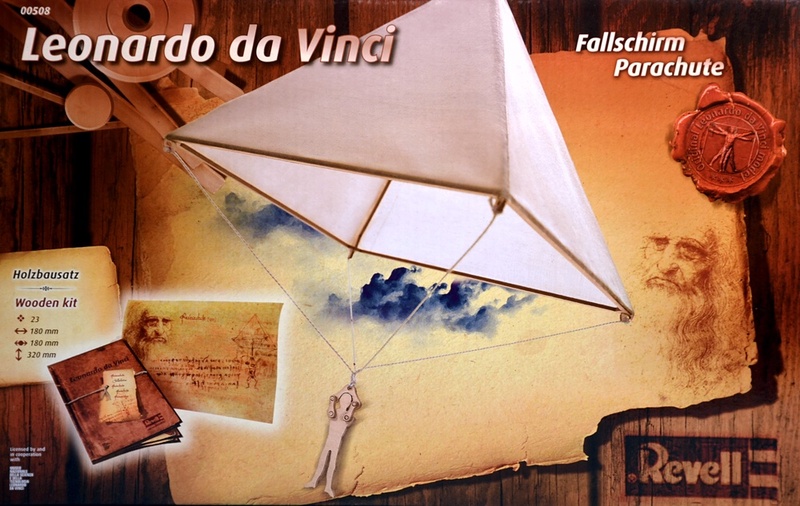 Here we see the latest in the innovative Revell series, depicting the machines and inventions of the Renaissance artist and inventor, Leonardo da Vinci. The Revell kit follows the pattern set in the rest of the line, being made of mixed ‘natural’ materials, so there's nothing that would appear strange to Leonardo himself, in this case in the form of wood, cloth, and thread ‘rope’. 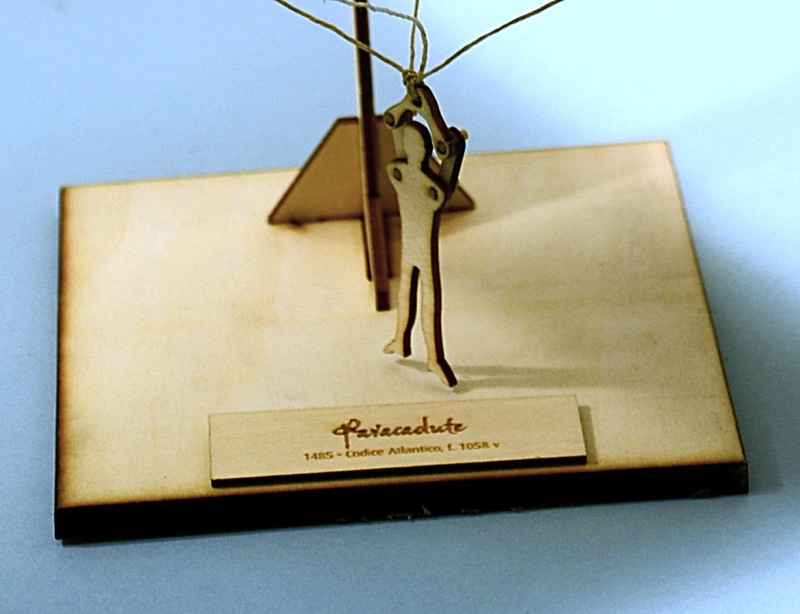 The parachute kit is one of the simpler ones in the range, with six components making up the parachute frame itself, eight for the parachutist figure, and five for the stand, including a nameplate. Also in the box are the cloth and thread. Width across each side of the wooden frame measures some 180 mm (7.1 in). 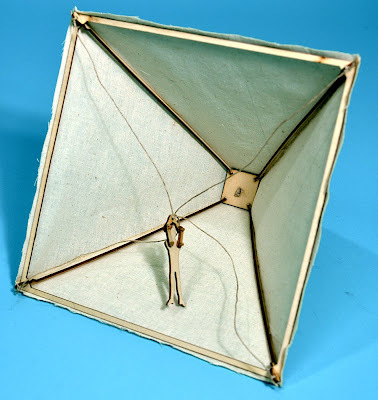 With the main parachute frame completed and allowed to dry, the pre-cut (and ‘pre-antiqued’) cloth is glued to each side, the excess cut off when the glue has dried. 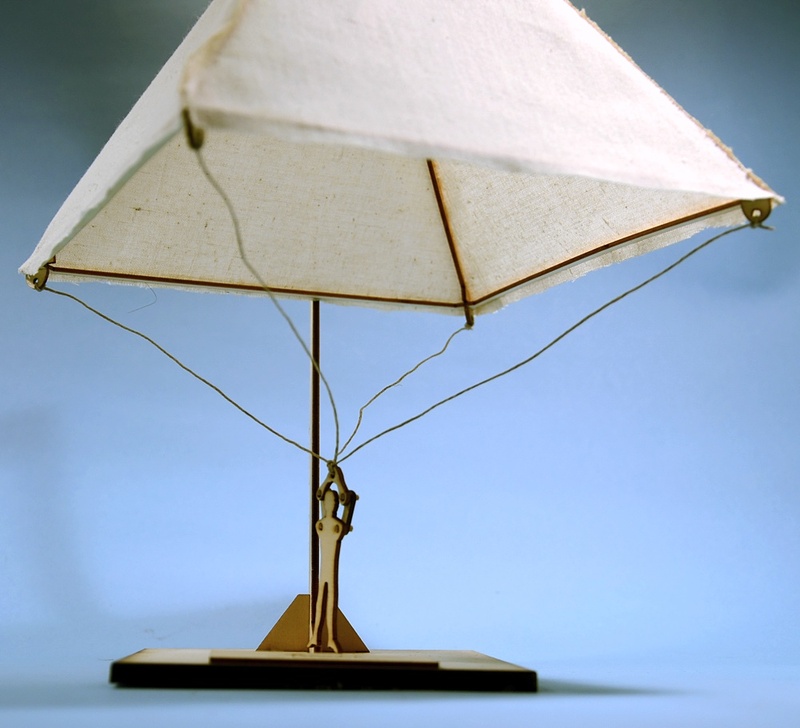 The human ‘passenger’ is a stylised two-dimensional shape and is a slightly weak point, as it is not really heavy enough to stretch the thread ropes enough. 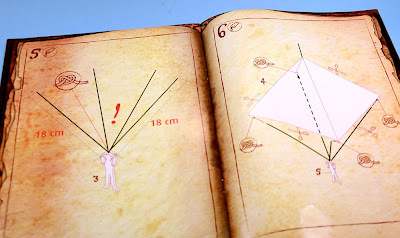 For this aspect to look better, the little figure really does need to be heavier - you could add backing with thin brass sheet, or even replace him completely. The parachute is approximately 1:32 scale, so for a more realistic look, you could simply replace Revell’s wooden man with one from an existing kit. 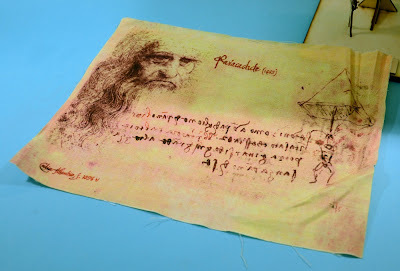 Always fascinated by the idea of flight, Leonardo looked at many aspects pragmatically, studying the flight of birds and working out that many aspects could be reproduced using appropriate technological and engineering skills. 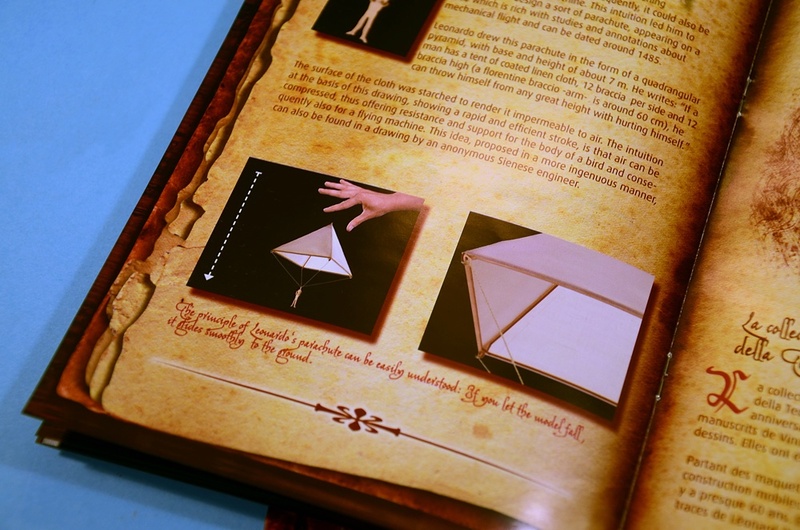 For the parachute, he reasoned that if air could be trapped inside some sort of shroud, it would slow the descent of a person hanging underneath. His parachute, although somewhat different to modern designs, works similarly. 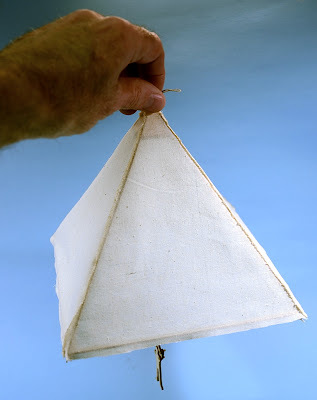 It biggest weakness would have been the weight of materials - wood and starched cloth are far heavier than lightweight nylon. Whether anyone ever tried out Leonardo's parachute for real is unknown. 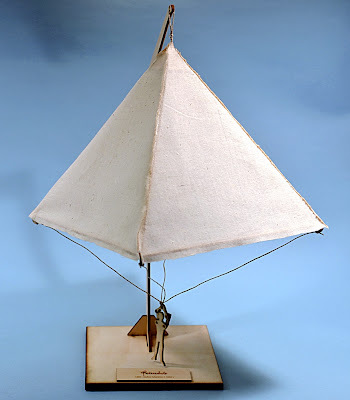 Most Leonardo designs were never actually built, though this model shows that the basic design was feasible. So far as the Revell model goes, you can test it easily enough - just hold it up by the apex, and drop it! An interesting kit, though that little man does need a weightier presence. Thanks to Revell-Germany for the review kit. 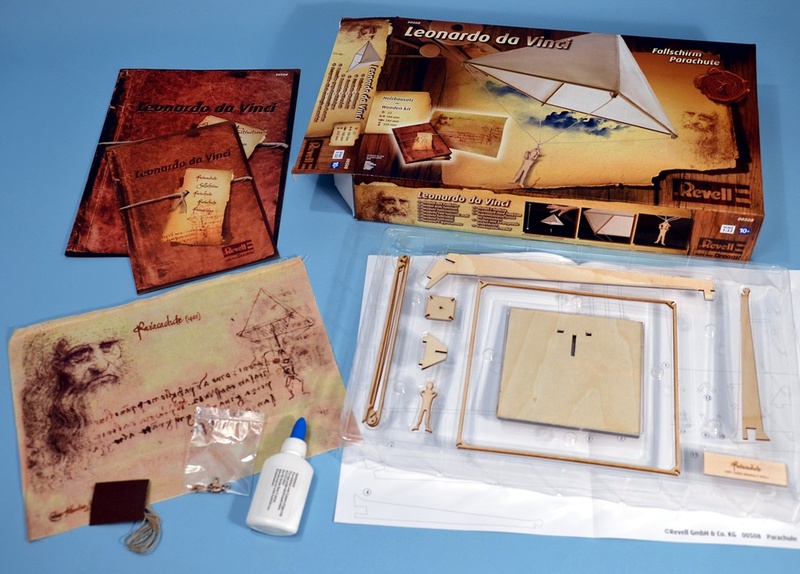 Leonardo kits, including the parachute, available here.